Although the U.S. Department of Agriculture recommends eating seafood and vegetarian protein sources, such as beans, more often, this doesn't mean you can't eat lean cuts of meat in moderation. 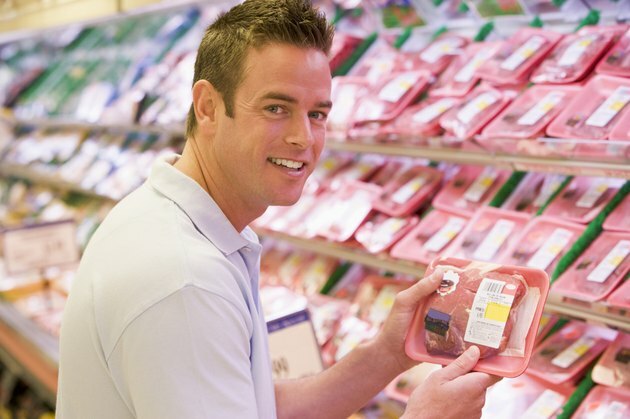 Meat provides healthy protein along with vitamins and minerals, such as vitamin B-12, iron, zinc, phosphorus and niacin. One type of meat isn't always leaner than another, as the different cuts vary in fat and calorie content. Game meat tends to be lower in fat than conventionally raised meats, as does meat that is raised mainly on grass, such as bison. A 3.5-ounce serving of cooked bison contains 143 calories and 2.4 grams of fat. Venison is almost as lean, with the same-sized serving providing 158 calories and 3.2 grams of fat. With meat this lean, you may need to use different cooking techniques to keep it from getting tough. These include marinating the meat, cooking it on low heat or for only a brief time and moistening the meat with a thin coating of oil before cooking. Skinless poultry tends to be one of the leaner sources of animal protein. Opt for skinless chicken or turkey breasts because much of the fat is located in the skin, and light meat is leaner than dark meat. A 3.5-ounce serving of roasted chicken breast has 165 calories and 3.6 grams of fat, compared to 179 calories and 8.2 grams of fat for the same amount of roasted chicken thigh. Depending on the cut you choose, pork can be even leaner than chicken once the visible fat is removed. The leanest cuts include pork tenderloin, top-loin chops or roast, center-loin chops, rib chops and sirloin roast. A 3.5-ounce serving of roasted pork tenderloin has 143 calories and 3.5 grams of fat. Beef is one of the fattier types of meat, but if you choose the right cut or opt for grass-fed beef, it can be a bit leaner. Grass-fed beef is between one-third and three times leaner than conventional grain-fed beef, according to an article published on the Mother Earth News website in 2005. The leanest beef cuts are those with "loin" or "round" in the name, as well as chuck shoulders and arm roasts. Cuts labeled "select" are leaner than those labeled "choice" or "prime." A 3.5-ounce serving of select broiled beef tenderloin that has been trimmed to remove most of the visible fat still has 194 calories and 7.8 grams of fat.